Formed in 1874 Tarff Rovers was one of the oldest clubs in the South of Scotland. 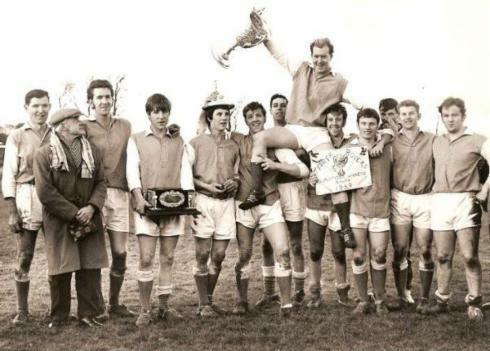 They were full members of the Southern Counties Football Association and the Scottish Football Association. Membership of the latter entitled them to take part in the Scottish Qualifying Cup South and on occasion the Scottish Cup. In 2003, after 156 years, the club folded when they were unable to form a Committee due to falling local support. Back - A McWilliam, A Love, A Morrison. Centre - A McMaster, J McAvery, J Campbell, J McKie, T McKie, J Cathcart (Club Secretary), A Simpson (Trainer), Front - J Bell (Club President), T Campbell, T McKie (Team Captain), J Cloy, H McWilliam. Kirkcowan was reputed to be the smallest village in Scotland to have a senior football club and despite the low population often managed to achieve attendance figures of over 1000. 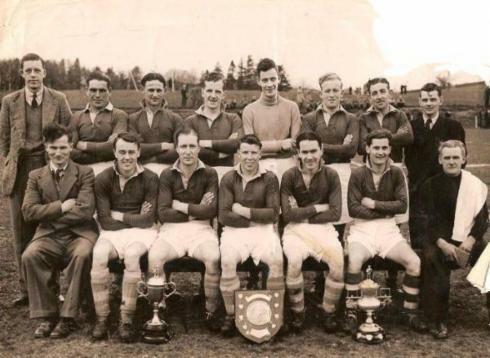 The above photo could be a Southern Counties Select Team but it includes Kirkcowan men. 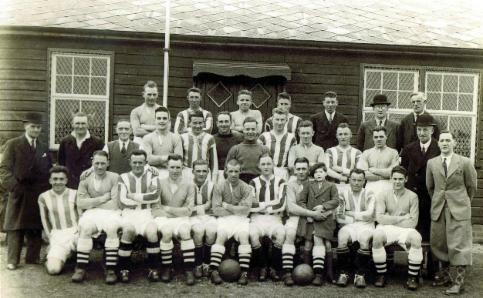 The following two photographs were taken on the same day, the first being of both teams - the visiting team is believed to be Ayr United. The game was a friendly - Tarff Rovers were leading 3-0 after the first half hour of the game but were eventually beaten 5-3. 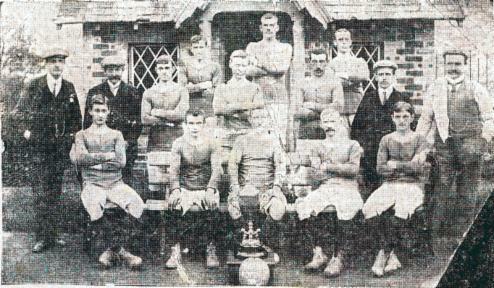 You will be able to pick out the names of the Tarff Rovers team from the following photograph. John McKie (blacksmith known as 'Blacksmith Jock'), not known, Sam Gordon. notes: All the players were from Kirkcowan with the exception of Johnny Nelson who was from Stranraer. Willie McWilliam was considered to be an oustanding player in whom Manchester United showed interest but sadly he was killed in the D-Day landings during World War 2. 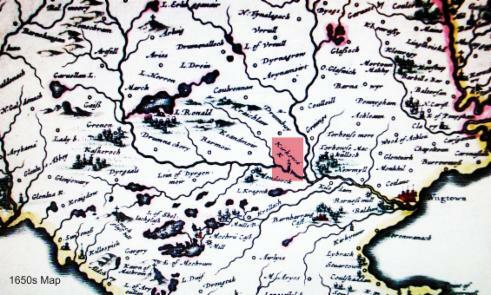 Over the years the club played at a number of different locations around the village of Kirkcowan, namely Ring Park, Barlennan Park, Barhoise Park, Dickson's Park before finally settling at Balgreen Park around 1923. 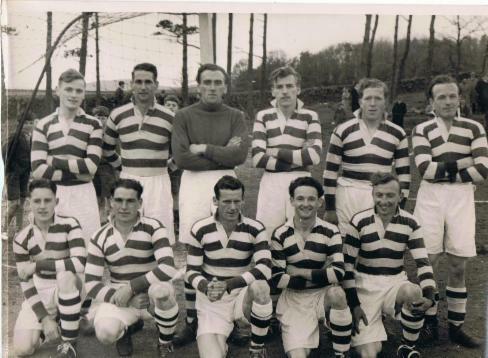 Tarff Rovers reached the final of the Qualifying Cup in the 1953/54 season but sadly they lost 4 - 5, on aggregate, to Peebles Rovers. They also lost 9-0 away to Hearts in the 1960/61 season. During the team's final years there were some 'big name' signings including Rowan Alexander and Chic Charnley. 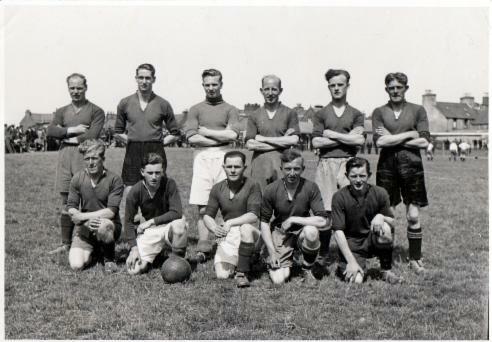 One of the features of Tarff Rovers was their strong connection with particular local families namely the McKies and McGeochs with more than one family member playing in the team at the same time. My father used to recall that the only time he had ever ventured away from Scotland was to travel to Berwick on Tweed to watch Tarff Rovers play. The next time was to visit London in the 1970s. One of the keenest supporters of the local team was the late Rosie McGaw who tirelessly helped raise funds by selling raffle tickets. So keen was she that, during the 1969/70 season, she even tried to sell a raffle ticket to the Falkirk goalkeeper as he left the field at half time. Front left Billy McKie ? - in the background (spectator)at the left is that Joe Wright? It can only be the 1970s - mullets to die for !! - still won the cup though ! Another keen supporter was Bill Love who saved the club from folding in the 1930s. Bill's support lasted over 70 years and on that occasion he sold his prize canaries to raise cash to save the club. Saturday 13 February 1954 was a memorable day for Tarff when they were due to play Partick Thistle in an all ticket Scottish Cup Tie. It was felt that the ground was a little uneven for such an important game. This was to be solved by using a road roller borrowed from the local quarry at Boreland Fell. The unfortunate result was that the inevitable happened and the roller sank into the ground with disastrous results. Despite this the game went ahead and Partick Thistle 'scraped through' by a mere nine goals to one, the Tarff goal being scored by local hero Buff Douglas (from Stranraer). At the match were Tarff fans Malcolm McCutcheon, John McCutcheon and Billy Whitson who consoled themselves after the defeat by collecting all the empty beer bottles left by the Glasgow visitors. These were exchanged for a small fortune (in 1954) at the Tarff Hotel. Those were the days when empty beer and lemonade bottles were worth one penny and empty jam jars a halfpenny (pre-decimal). Grocer Willie Armstrong knew that only too well as my brother and I used to go round old dumps and dig up bottles and jars and give them to him unwashed - he was often heard to say 'Oh no its those boys again ! '. Forever the gentleman he always took them and gave us the money - what a nice man. For many years Kirkcowan has also had a juvenile team and continues to use Balgreen. 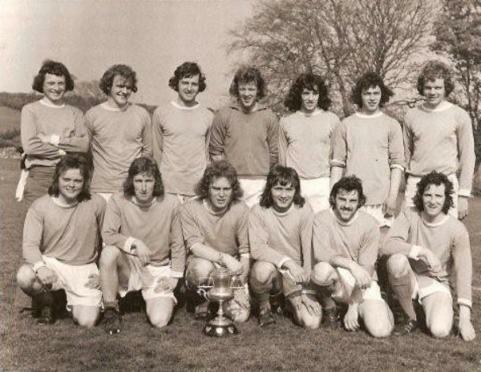 The photo below shows the team when it was run by the late Bill McKie (two of his sons, Billy and the late Stewart, are also in the photo). 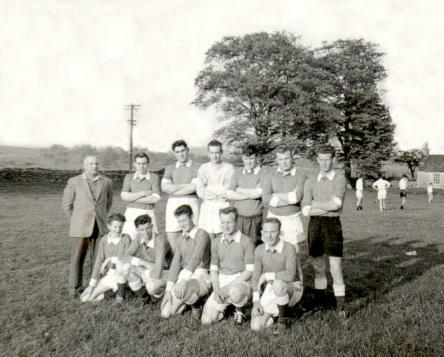 Back l to r: Trainer Bill McKie, George Adams, Tom McGeoch, David Rae, Hugh McNeill, Willie (Blondie)McCall, Bobby Cloy. 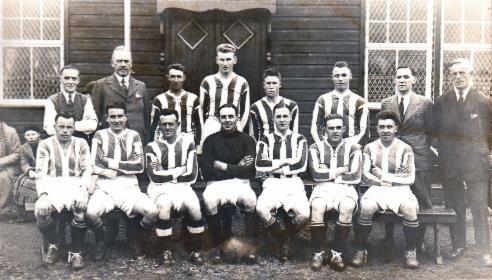 Front l to r: Stewart McKie, Billy Whitson, Billy McKie, Willie Hyslop, Robert Dickson.